What are Madara Uchiha's weaknesses? At his current state, how could Madara possibly be defeated? Shinra Tensei (which wasn't seen yet, but we have to assume he's capable of it). And I'm not even starting to talk about the Rikudo mode. Any non-physical attack would be easily absorbed by the Preta Rinnegan path. There aren't many ultra-powerful genjutsu ninja who can hope to trap him in a genjutsu for more than 2 seconds. And in the offshoot that something does hurt him, he'd just regenerate. He's a zombie. What weakness does Madara have that could be exploited to harm him? They'd have to damage him badly to hope for a seal. It does not seem like any of Madara's new abilities have a counter to sound genjutsu, especially when boosted by Senjutsu / Sage mode. 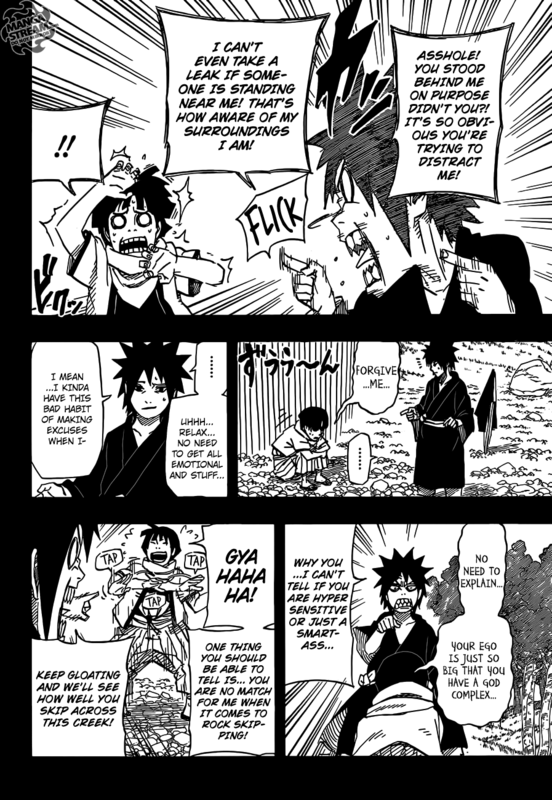 While sound genjutsu and Senjutsu are both very rare, the manga has shown two examples of different techniques of that type being effective against techniques that Madara has recently gained. The two Sage Toads' sound genjutsu is effective against the Rinnegan. When Jiraiya had them use it in his battle with Pain, it was able to easily overcome 3 paths of Pain. When Kabuto in Snake Sage mode used Tayuya's flute sound genjutsu, he was able to immobilize both Sasuke and more notably, a Susanoo-wielding Edo Tensei Itachi. The pair were only able to escape by using Sharingan genjutsu on each other. 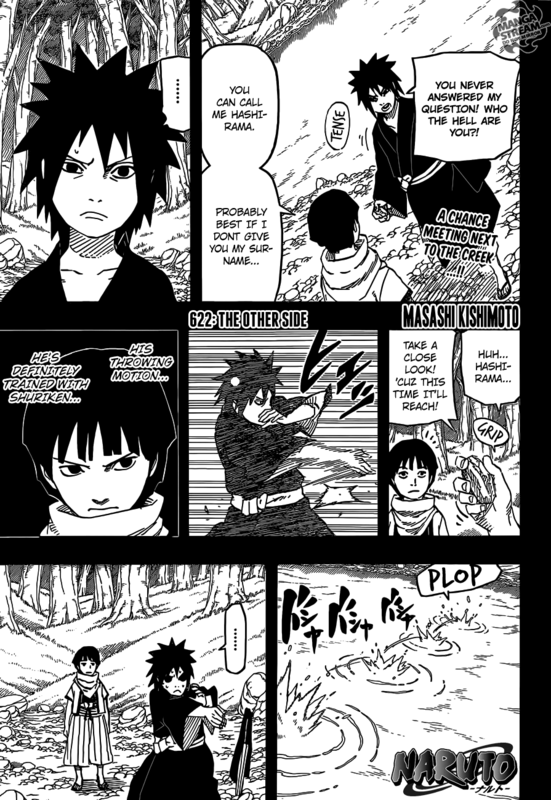 Chapters 622 and 623 hint at a possible weakness of Madara Uchiha. 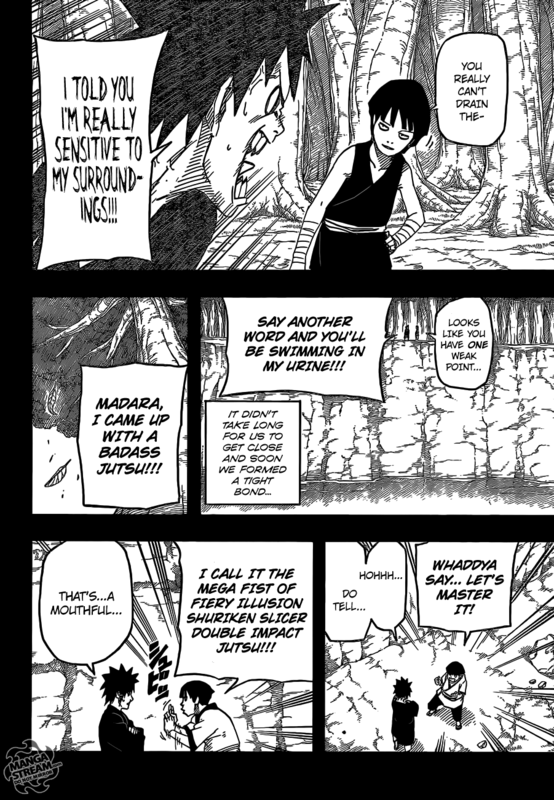 In Chapter 622, it has been shown that Madara has issues with being too aware of his surroundings, and being easily distracted or have an inability to focus properly. He also has issues with pride, that he carried on until his adulthood. 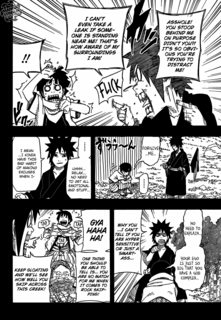 In Chapter 623, the same possible weaknesses has been shown. He even claimed that he didn't have any weaknesses.  . Credits: All images are from Mangastream's scanlations. They mentioned in the latest chapter that Madara is vulnerable to Taijutsu. Also, as grasshopper said, his overconfidence causes him to drop your guard when dealing with those he thinks are not able to harm him. Currently the only combatants I could see do lasting damage to Madara would be the recently resurrected Hokages. Currently Madara has the following: full control of Hashirama´s cells, Rinnegan, an invulnerable body and an infinite supply of chakra (courtesy of the Edo Tensei), the Eternal Mangekyo Sharingan and the most powerful Katon of all time. Kishimoto has outright said that he has no real weakness. The closest thing to a weakness he may have is Taijutsu, but since it does no lasting damage it´s frankly as useless as everything else one could use against him. Only an intervention from the 1st-4th Hokage could possibly defeat him right now, as he is a cocktail of the 3rd strongest person of all time and all the overpowered abilities in the series. Is sound genjutsu more powerful than eye genjutsu? What exactly is the technique Madara uses to control Obito? Who created the Uchiha's Clan's stone tablet in the Naka Shrine? What did Madara mean by “showing our guts”? Why is Madara supposedly dead? 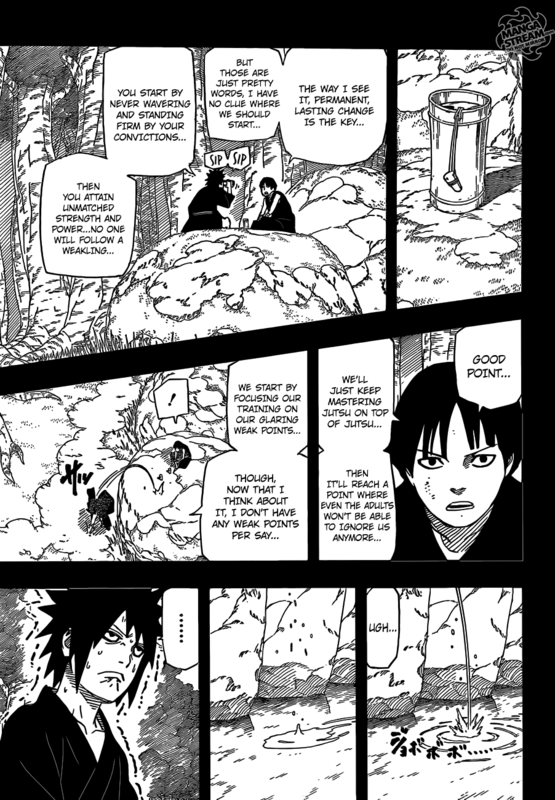 What reason was Madara talking about in Chapter 661 ? What kind of technique is Madara using? Why didn't Orochimaru fight Madara?